Historical fact: Medina sandstone cobbles are used at Buckingham Palace. 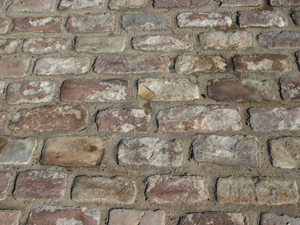 Mined from WNY quarries and reclaimed from streets in Buffalo, New York, these cobbles range in color from red to gray to tan. They are approximately 6.5” thick and randomly sized. These cobbles have many purposes. They can be used for building facades, retaining walls as well as paving.